(Mens L) Ugly Xmas Sweater Super Soft Caroling Teddy Bears Looking in Your Window! Home > Ugly Christmas Sweaters > Ugly Christmas Sweaters (pullovers) > (Mens L) Ugly Xmas Sweater Super Soft Caroling Teddy Bears Looking in Your Window! Mens Ugly Christmas Sweater. 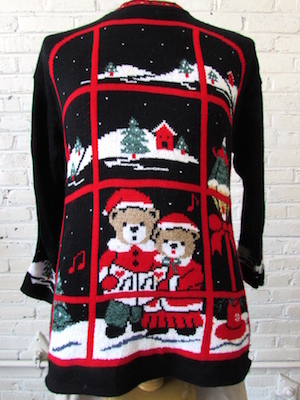 This Super soft black knit acrylic Xmas Sweater has two super cute teddy bears Christmas caroling in the snow in front of a window! The area just above the cuffs is encircled by a images of snow, little red houses and pine trees. The collar is trimmed with a red knit that with green, black and gold dots in it. Acrylic/ Lurex. Condition: Very Good. There is some brown staining on the right cuff. Does not detract from the awesomeness of this sweater. Chest: 42" best for a mens Snug LARGE.